The past week has been full of many tiny moments that have filled me with joy, and as we're in the depths of winter here in the U.K., and the world's political situation is not what I would wish for, I thought I would share some of these moments with you. A friend on Instagram has just started selling Jamberry wraps and held a little competition to identify the wraps she was wearing. I won! And received a lovely little package containing half a sheet of wraps (enough for a full manicure and pedicure) and a sheet of samples. I've not used the full set yet, but have used a couple of the samples as accent nails and am really pleased with how they look (they've had lots of compliments). If you fancy getting hold of some for yourself, head to Natasha's Jamberry page. My friend Amy sent me an unexpected parcel containing two of the Enid Blyton parodies that came out for the Christmas market. I've just finished Five Give Up The Booze and loved it, so am very much looking forward to reading the second. The parcel also contained a ball of yarn sew-on patch that I will one day add to my camp blanket! The postman has had a busy week, as I also received thank you letters from afar, including a parcel from Nikki that contained a book by Scarlett Thomas, whose work I love (I will confess to already owning the book, but it has reminded me that it's been a long time since I've read it, so I've added the new copy to the reading pile), and two mini balls of sock yarn to add to my sock yarn blanket. Last week at my regular knitting group a friend noticed that my hands were looking rather dry and cracked, and when I next saw her on the school run she handed me a pot of handmade hand cream. It's working wonders. Another thing that is working wonders is covering the cut on my finger with micropore tape - it's enough to help my finger recover without stopping me from knitting! I'm glad I mentioned it on the blog, as the recommendation came from a comment on here that Rachelle left for me. This has also allowed me to make huge progress with my socks. I'm only working a stripe every day or two, but am getting through them - they're doing much better than they were a couple of weeks ago! What little things have added joy to your week? 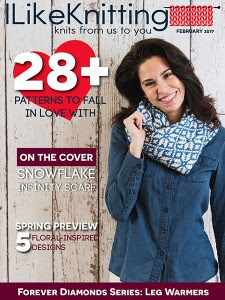 Every once in a while the team at Knit Now publish a compilation of knitting patterns that have appeared in their magazine. 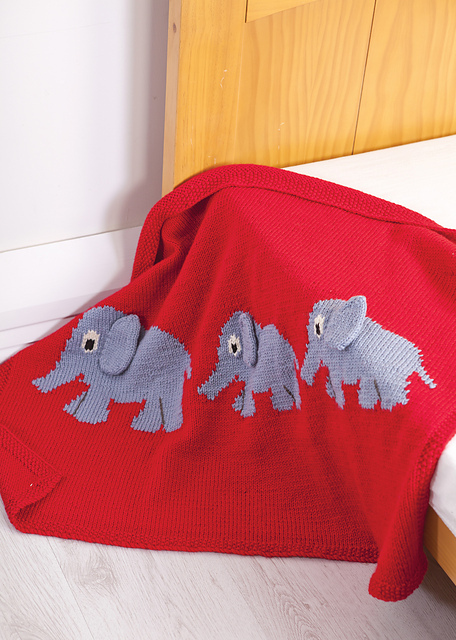 The collections are always themed, and the latest is quick and easy baby knits, and features four of my patterns: Elephant Parade, Barley Twist Cardigan, Reach for the Stars baby jumper and Hedgehogs and Hoglets. Elephant Parade. Image copyright Practical Publishing. Barley Twist cardigan. Image copyright Practical Publishing. Reach for the Stars. Image copyright Practical Publishing. 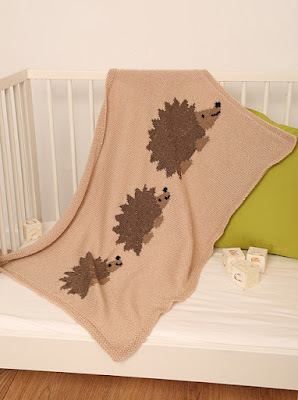 Hedgehogs and Hoglets. Image copyright Practical Publishing. 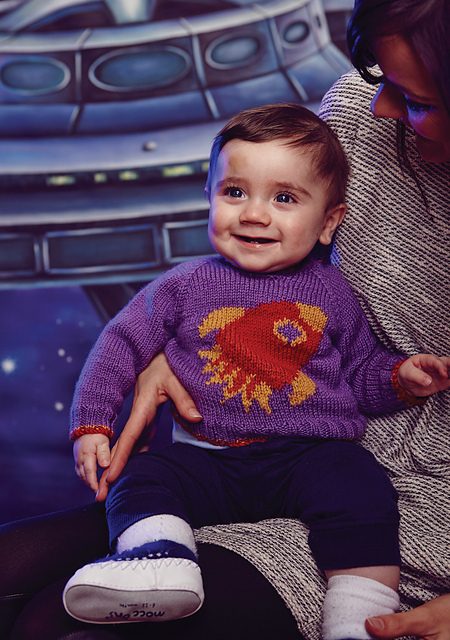 The magazine also features an excellent selection of baby knits from other designers. My favourites include Lucy Lamb by Barbara Prime and Beach Hut Cushion by Kim Dickinson. Lucy Lamb by Barbara Prime. Image copyright Practical Publishing. 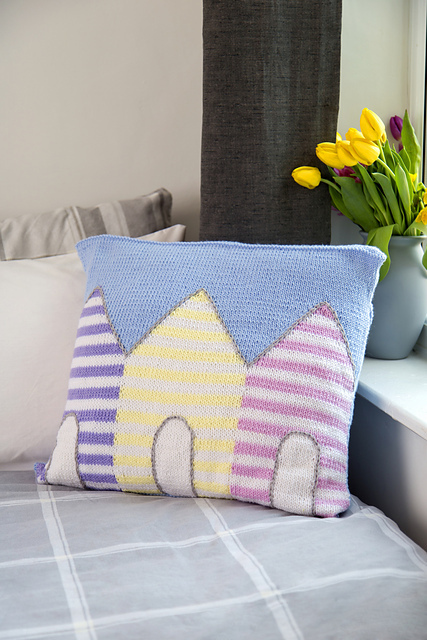 Beach Hut Cushion by Kim Dickinson. Image copyright Practical Publishing. The collection is available at many newsagents and supermarkets, or can be ordered online, and is a bargain at only £7.99. Just after Christmas I offered to knit a pair of socks for a friend. She wants a pair of hand-knitted socks, and while she can knit, she's struggled to knit socks that fit in the past, and I always have socks on the go and there are only so many pairs of socks I can wear myself, so I offered to knit some for her. Simple. I chose the yarn, Sirdar Heart and Sole that has been in my stash for a while, and cast on a pair of toe-up socks. I used my usual pattern and set to work. But they weren't growing (I hadn't finished the toe increases a whole week after casting on). While I knew they were on the needles, I wasn't wanting to knit on them, and I wasn't sure why. So last week I decided that I was going to knit a stripe a day on them to make sure they get done in time for my friend's birthday in March. I got two and a half stripes into the first sock and there was a funny join in the yarn - a single ply had been knotted, and an end twisted in a little untidily. I persevered and knitted over the end, which seemed good and strong, but when I got to the end of that stripe, while I was looking closely at the join section, I noticed that my sock was getting larger the further I got from the toe. I thought about it for a bit and remembered that I'd had similar tension problems last year using the same needles. So I did the only sensible thing: snipped the yarn and cast on a new sock on new (and totally different) needles. I'll unravel the old toe some other time. The needles have gone in the bin (one tip was bent anyway), and the other pair of needles that are the same will also be leaving the house. No one wants to battle with their needles while they're knitting socks! Since I swapped needles the sock has grown much faster. I now have a different problem - the new needles have reopened the small cut in my finger tip. Argh! I can't wait to get these socks finished... Do you ever get the impression that some items just don't want to be knitted? Another busy week here, so there's been rather more than a week between weekly posts, oops! Last week was crazy busy. Last Thursday was my PhD graduation ceremony, so I got to spend the day prancing around in a silly hat and fancy gown (at one point I even had a wand! Nothing to do with the ceremony) in the wonderful surroundings of Durham Cathedral. I had a last minute panic about what to wear when I realised how little of my outfit would be covered by the gown, so made a dash to Next the evening before to buy a black dress, and had to buy a black jacket on the morning of the ceremony as it was freezing when I got up (and snowing, which was fortunately short-lived, but I did have to walk very carefully to the bus stop as I was in danger of falling over in my heels! The day was lovely, especially as my parents had come up for the week so they could attend. Not everything last week was excellent; my husband was in a car crash early in the week, and while he's absolutely fine the car is not and has gone off to be scrapped. This has left me without a car, and while I live on a bus route it's still a little annoying as everything is taking longer than usual. In addition my son and I have both been a little poorly, nothing more than colds, but enough to wipe us out for a few days. I think we're all better now though, and are starting to make progress on sourcing a new car, so things are definitely not all bad. Over the past few weeks we've started reading the Harry Potter books to my son. We're only on the first (and might pretend for a while that the later ones don't exist as I'm pretty sure he'll find them scary), and I am loving revisiting the series. So on Saturday night I rewatched the first film (for vetting purposes). I'm not sure I've watched it since I saw it in the cinema in 2001 (?! ), and it is as wonderful as a I remember, so that pleased me hugely. I'm looking forward to watching the later films. I have managed to make some decent progress on some crafts over the past week or so. My finger has heeled (finally), and I have finished the first pair of socks of the year. They're in Regia Stripemania Colour, which is a DK weight yarn, and have gone in the gifting pile. I cast another pair of socks on the bus on the way to graduation, and even though that was a week ago I have made so little progress they're not worth showing! At the weekend I got some long overdue pattern cutting done. I've been meaning to make a dress for my friend's daughter for ages, and when I finally got round to cutting the pattern out I realised I needed to cut out the largest size. Isn't the fabric lovely though? And as they live in Australia I don't need to worry about the baby keeping warm. I have also been cracking on with lots of design work, especially this week as I'm back into the normal routine. I am about to cast on a new blanket, and am halfway through a pair of socks. Nothing to share now, but there will be soon. This week I made an Instagram-enabled purchase. I've been following Yarnistry for a while (I mentioned them in my Christmas gift list last year), and earlier in the week she posted a photo of her new glittery dinosaur stitch markers. I was completely powerless to resist, and was delighted when they arrived in their holographic posting envelope. And I love them. They'll definitely be used on the next project I cast on. Last night I made an impromptu visit to the cinema. I'd seen trailers for La La Land, but not with the sound on, and knew I wanted to see this film. It's a romance and a musical, set in present day Hollywood about a wannabe actress (Mia) and a purist Jazz-enthusiast (Sebastian) who dreams of setting up his own Jazz club. I loved everything about this film. The set piece at the start really gets you in the mood for the film. The whole thing is beautifully acted, and the costumes are wonderful - there is so much colour in his film. It is strongly reminiscent of old-school musicals, with the likes of Doris Day, with both ballroom and tap dancing. The film is about the power of dreams and ambition, but also how these can be interrupted by real life things like having to pay the rent. The ending of the film is wonderful, yet it made me cry so much! This film is one I will watch again; it's perfect. The film also left me for a hankering for a dark green silk dress and a new red handbag. In fact I loved Mia's whole wardrobe, in its pallets of bright primaries. The school run this morning did, however, remind me that while floaty dresses may be suited to the Hollywood climate all year round, they're not practical in Durham; it was freezing this morning! That's it from me this week. What's everyone else been up to? I write a lot of patterns for Knit Now magazine, and while the rights revert back to me within a few months of publication, it can take me a while to get round to adding them to my Ravelry store (I need to reformat them and add my own photos, which means re-publishing often gets put to the bottom of the to do list as these things are time-consuming!). 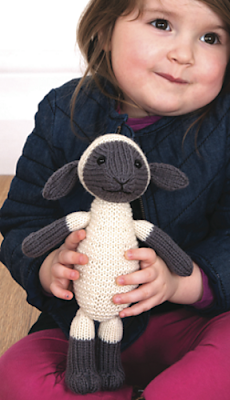 One of the questions I get asked most frequently by customers is how to get hold of the patterns I have published in Knit Now before I self-publish them, but after the print issue is available. The answer is to buy the digital issue of the magazine. 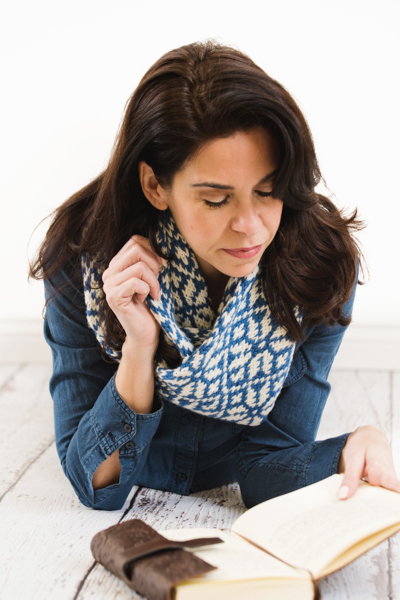 Digital issues of Knit Now magazine can be purchased through Pocket Mags, and allow you to read issues that are no longer in print. Pocket Mags has a handy page of digital magazine FAQs here, which may be helpful to you. I do hope this post has been helpful. And I am currently working hard to get all my third-party publications up in my Ravelry store. Last year at The Flock launch party I met a lovely blogger and podcaster called Nikki. * I have been listening to her podcast Tea and Possibilities ever since (and if you haven't checked out her podcast already, I would definitely recommend it, especially if you like knitting, books, tea and Harry Potter; it's a lovely cheerful corner of the internet). This year Nikki is running a year long knit and crochet along (might even be a craft along, you'd have to check) called the Best Year Ever CKAL in her Ravelry group,* and the aim is to make four things over the course of the year that make you happy. I know that joining in a CKAL so early in the year is clearly a breech of my "no more KALs" rule, but this one is pretty straightforward, and I was planning on making (at least) four things over the course of the year anyway, so I'm definitely on board. All you have to do is make four things and post about them in Nikki's Ravelry group. So what are my four happy-making things? I cast on an Antler cardigan for myself last year and rapidly decided I had started the wrong size and that I wanted a jumper rather than a cardigan. This year I am going to get that back on the needles and get the garment I want. I'll be knitting it in Sirdar Wool Rich Aran, which I believe is discontinued - I managed to snag ten balls (that's a full kilo) for just over £25 last January with this garment in mind. I have loved this Tin Can Knits pattern since before it came out a few years ago (I think I snuck a look at it on a testing thread). The cardigan is beautiful, and so unusual. I bought the yarn for it in a clearance sale at the department store near my parents' house at some point in 2015, definitely with a plan to use it for this pattern, and haven't got round to casting it on yet, but will do this year. For a minute I thought about completing it time for a yarn retreat I'm going to at the end of February, then remembered that was a crazy idea! Having said I only got one ball of wool for Christmas, this week's post proved me wrong when the Christmas present from my brother arrived: two skeins of Malabrigo Worsted in an amazing shade of purple. This will definitely become a shawl for me to replace the purple one I made last year that was too itchy for me to wear. I'll probably use one of Susan Ashcroft's shawl patterns as I want to use every last scrap of yarn, and the Love Train shawl I made last year gets a lot of wear. I have talked myself out of knitting a unicorn head as my husband doesn't want an animal head up on the wall all year round, boo. But I think I can probably get away with a reindeer head instead as it only has to be out for about a month per year (though I am tempted to leave it up in the spare room all year round and decorate it seasonally for guests to appreciate). What happy things are you planning on working on this year? *You will need to be logged into Ravelry for these links to work. Ravelry is free to sign up to, and is an excellent resource for all things related to knitting and crochet. This post conatins affiliate links, see the Disclaimers and policies page for more information. Over the past week I've shown you not one but two shiny new designs, Granny's Button Jar and Leaf socks, and here is a third, my Snowflake Infinity Scarf. Image courtesy of I Like Knitting. The scarf is knitted in the round as a really long tube with a stranded, tesselating snowflake design that runs the length of the tube. When the full length required is acheived, the tube is cast off and the ends seamed to make the tube into a cowl. The cowl is long enough to be wrapped round the neck twice, making it very cosy (I think this cowl would be perfect for wearing on long winter walks, or while out in the snow). I love this design, and can't wait to get the sample back from the publishers! It's knitted in Rico Essentials Soft Merino Aran, which is lovely and plump and squishy. I definitely think this design could be worn by men and women, and the Rico yarn comes in a large variety of colours, so there should be something to suit everyone. And very excitingly, the design is on the cover! The pattern is published in the February 2017 issue of I Like Knitting magazine, an e-zine that is available via a subscription model. This post features affiliate links. For more details, see the Disclaimers and policies page. Last week I unveiled my first design of the year, Granny's Button Jar. Today I'm going to show you my second design for the year, Leaf socks. My ankle length Leaf socks are knitted from the toe up and use a gusset and heel flap construction. The socks have a leaf lace pattern across the top of the foot and around the leg, and the pattern is written in four sizes (finished sock circumference 6 1/2, 7 1/2, 8 1/2 and 9 1/2 inches). The pattern is published in the February 2017 of I Like Knitting magazine, which is published as an e-zine that can be accessed via a subscription model. The sample socks are knitted in Artesano Definition Sock, a 4-ply wool/nylon blend yarn, which is sadly now discontinued. The socks can be knitted in any 4-ply 'sock' yarn, e.g. a wool nylon blend or high-twist merino, though I would recommend using a solid or semi-solid so the stitch pattern shows up. A couple of suggestions are Malabrigo sock, a 100% merino with high twist for durability; the colour Lettuce would be perfect; or the classic Regia 4-ply, a good sturdy wool/nylon blend; the colurway Knall Frosch is ideal. I have one more new pattern to show you, but that can wait until tomorrow. Remember, Granny's Button Jar is available at the introductory price of £2.50 until the end of Tuesday (11.59pm, GMT, Tuesday 10th January 2017), just add the pattern to the cart and the discount will come off automatically. I've decided that this year I will try and post a few more progress shots of projects, rather than just declaring them done before I show pictures, so thought I would start by trying a little round-up post for the week. This week has been a busy one, with the kids going back to school and nursery, and I've had lots of little bits and pieces to catch up on that didn't get done over the holidays. I have enjoyed being in one place for the whole week and not having to travel the length of the country. My main project this week has been a sample for a new design for a magazine, so I can't show you more than these two pictures (it's seamed, and is purple), but now that's done, and I have been working on some things I can show you. I've been working on my Toft chameleon. Progress is a little slow as I can't work on him while I watch TV (I have have to look at crochet all the time, and as every round is different, it takes a lot of concentration). I have made it to the neck, and finally made a start on stuffing him yesterday, only to realise that I really ought to have started that step rather earlier! I had to use the blunt end of a knitting needle on the inside of the piece to poke the stuffing into the tail, and then the pointy end of the knitting needle to shuffle the stuffing around from the outside of the tail to give it a good shape. So fiddly! But worth it; the tail looks pretty fab now. My out and about knitting is the pair of socks I started during the holidays. I've not made much progress, but feel I ought to get cracking on them as they're currently housed in a Christmas project bag, and I don't want to hunt out a more seasonally-appropriate one. Annoyingly I've injured my 'pushing finger' (the one that I use to push the stitch off the needle when I've finished the stitch, so I constantly have a plaster on that finger (it is healing, but very slowly, occasionally I forget about it, remove the plaster, then promtly stab myself again and am back to sqaure one), which is starting to get annoying. Hopefully it'll be better soon. Yesterday I cast on a new project: a jumper for me! It's a reimagining of the Antler cardigan I cast on last year, then decided that I wanted it to be a jumper instead, and a bit bigger. I have knitted as far as the elbow on the first sleeve, but the only photo I have shows way to much of the chaos on my living room floor, so I'll wait until I've done a it more before sharing any photos. I have managed to stick to my target of reading for 15 minutes every day (though not necessarily by going to bed earlier - I slept for longer into this morning than I meant to, oops), and have finished my first book of the year: The Christmas Surprise by Jenny Colgan. I started reading the book over Christmas, and enjoyed it. It's part of the Rosie Hopkins' series (not that it matters - there's a series summary at the start of the book), and is a light, easy read. The surprises start pretty near the start of the book, so there's not much I can tell you about the story, but it's lovely and heart-warming, defintely one of the better examples of chick-lit out there. Hope you'vbe had a good week this week. What have you been up to? I thought I'd start the new year off with a bang, and have three new patterns to show you over the next few days. First we have my Granny's Button Jar blanket, which I previewed towards the end of last year. I knitted the sample blanket for a friend's new baby who made her arrival at the end of September, but this blanket is one that I have wanted to knit for ages. The blanket is inspired by the collection of buttons at my Mum's house, which includes buttons from her mother. I loved playing with those buttons when I was little - arranging them into patterns, threading them on to string and just admiring them. One of the highlights of Mum knitting a garment for me was being allowed to choose the buttons for it. The blanket is knitted in one piece with the buttons being incorporated using intarsia. I added the buttonholes at the end using duplicate stitch, but they could easily be knitted in as you go. The blanket has a moss stitch border that is knitted as you go. Granny's Button Jar has huge potential for playing with colour: the blanket as written features seven colours of button, carefully arranged so no colour is adjacent to itself, whether horizontally, vertically or diagonally (this was a feat, and required me to arrange and rearrange bobbins of colours many times!). But you could make the blanket with as many or few colours as you wish, making it great for using up leftovers from other projects, though I would recommend using the same fibres throughout to prevent distortion when the blanket is washed. The sample blanket was knitted in Red Heart Soft Baby Steps, which is a lovely soft acrylic yarn, but since I knitted the sample Love Knitting have reduced the number of colours available, making the yarn a little tricky to get hold of. The good news is that the blanket can be knitted in any plied acrylic, wool or acrylic/wool blend aran-weight yarn. I would recommend Paintbox Simply Aran (100% acrylic), which comes in an amazing range of colours, and is very good value for money. If you fancy something a little more luxurious, MillaMia Naturally Soft Aran (100% merino wool) is wonderfully soft, lovely to knit with and wears really well. The pattern for the blanket is available now via my Ravelry and Love Knitting stores. If you buy the pattern from my Ravelry store before 11.59 pm GMT on Tuesday 10th January, it's available at the special introductory price of £2.50 (just add the oattern to your car and the reduction will apply automatically); after this time it will cost £3.60. As always, I would love to see your finished project, so go ahead and set up a project page on Ravelry or Love Knitting when you cast on. For both sites, you have to set up a free account to post a project. I like the bit between Christmas and New Year: the stresses of Christmas are out of the way, there's a decent chance the children will entertain themselves for at least a little while with their new toys, enforced holiday means we get a good stretch of family time, and there's time to do a few little things that I haven't got round to over the rest of the year. I'm not sure where the word Twixtmas came from - a friend used it last week and I realised that I have definitely called it that before, so from now on I'm going to use the word as it's a lot easier to say than 'the week between Christmas and New Year'. So what did I get up to this Twixtmas? First, on Boxing Day, I knitted a sock from the yarn I got for Christmas (I showed it to you last week). I also found time to knit the second sock, and I really like how they turned out. The Regia Pairfect was easy to turn into matching socks, which is how I like them. I started to crochet my TOFT chameleon, which was my Christmas present to myself. It's crocheted from the tail up, which was so fiddly! I've used the first of the four (25g) balls of wool supplied, so I've still got a way to go, but I think it'll be easier from here on in (I can now get two fingers into the piece I'm working on, which is making it much faster). I cast on a second pair of socks, and have already knitted the first. It's knitted in Regia Stripemania, which is a DK weight yarn. These ones are going on the gifting pile as I don't wear DK socks, but I know people who would be delighted with them. We played some board games as a family. My son got Hungry Hippos for Christmas and I think we all enjoyed playing, even if the games are over in a flash! Ticket to Ride also went well - the aim is to build routes between cities and a complicated points system defines who's won. We've been playing it on the iPad recently, which is easier as the routes you have to try and complete are indicated, whereas on the board you have to remember where you're going, or constantly check your route cards. We decided to play the board game version with our 5 year old and once we'd made the concession of placing markers on his routes it worked well. I want to go to the cinema more this year as I love watching films, but pay little attention when I'm watching them on tv at home. I started this aim well by taking my son to see the BFG at a children's screening on New Year's Day. It was lovely to watch a whole film without distraction. I got a KitchenAid for Christmas, and had fun testing it out by baking a chocolate cake. A friend bought me 1.5kg of mixed Jazzies and Snowies (chocolate sweets coated in hundreds and thousands), so I let me daughter stick loads on to decorate the cake, nibbling the odd one as she went. One afternoon we walked into town from our house, which we don't do often as it's just a bit beuyond what the kids are happy to walk, distance-wise. But with the aid of a scooter, they joined in happily enough. It was one of the days when the frost never really cleared, but the low sun shining over the hills was glorious. A lovely week of simple things with no time pressure. What did you get up to over Twixtmas? The end of 2016 and the start of 2017 has had me thinking about things I'd like to change about my life over the next twelve months. Not exactly resolutions, but some things I'd like to try and do to make life a little better or simpler. Some of them are things I'm hoping to develop into habits that will be here to stay. So here goes, 12 things I'd like to try this year. I spend a lot of time joining in KALs and swaps and other knitting bandwagons, but actually they stress me out. I have written myself a plan of what I would like to knit and design over the next few months, and will try my hardest to stick to it. The same goes for impulse casting-on of projects, they make up the vast majority of projects that languish unfinished. The stash is starting to take over the house; if I open a cupboard in any room other than the kitchen (and the bathroom, I'm pretty sure there's no yarn in there! ), there is a strong chance the cupboard will contain some yarn. So for this year, I'm hoping to establish the habit of checking whether there's anything in my stash that would do, before starting a project, rather than buying new yarn, then remembering when I get it home that I already had some of whatever I bought. A continuation of point 2, from today I am not going to buy extra yarn to make up free postage - I never knit those balls. Instead I'm only going to buy one project's worth of yarn at a time, and only for the project I want to cast on. And when I've finished a project, I'm going to look closely at the leftovers and decide whether to keep them or pass them on. I don't often use leftovers, so there's not much point in giving them house space. The sock yarn box is especially full, so no more sock yarn purchases: no sock yarn that is on sale, waved at me from Facebook, Etsy or Instagram, or comes in a mystery box. When I next want to cast on a pair of socks there will be plenty of sock yarn in my stash, and if none of that takes my fancy, I can always buy a single skein. I used to be quite an organised person, but the stresses of two children seem to have made me rather scatty. This year I am going to write lists for everything: finances, children's events, meal plans, the ins and outs of my stash. There is some hope I might start to get my life back in order! The year I had my son I read well over 50 books, including the Booker Prize shortlist (let's pretend it wasn't the year that the shortlist was criticised as having been dumbed down). And since then I've not read much at all! So I'm going to try and go to bed a few minutes earlier every day and get a bit more reading done. I've already got a page ready in my notebook to fill with the titles of the books I've read. The run up to Christmas in 2016 was a little stressful as I had a backlog of gifts I wanted to make for people, but totally ran out of time. So this year I'm going to start gifts well ahead of time and store them to give away later, making sure I keep a note of who I've made gifts for so I don't end up making gifts twice or two gifts for one person (it has happened...). Because I don't do it often enough, I'm going to add backing up the computer to the calendar and make sure it gets done, at least once a month. I am so far behind with editing my family photos (I think I was last on top of it the week before my daughter was born, over two years ago) that it feels like an impossible task, but actually a couple of hours a week is all it will take for the backlog to stop getting bigger, and that is doable. So one evening a week will be dedicated to editing photos, and by the end of the year it'll be really easy to print photo books for Christmas! Every time we go out one of the kids will say they need a drink or something to eat, and it's always best to be prepared! The final one is a big one, but one that only needs ticking off once! Since I finished my PhD I've been muddling through with bits and bobs here and there, but I've finally decided that what I want is a nice reliable job to make the money to pay to do the things that make me happy.